The Londonderry Rail Trail is a cooperative effort between Londonderry Trailways and the Town of Londonderry to complete 6 miles of trail on the abandoned rail corridor that runs through North Londonderry. This project started in earnest around 2012 and 3.2 of the 6 miles are now completed! The goal is to create a multi-use recreational path that enhances the quality of life for Southern New Hampshire residents and provides opportunities for economic development in the town of Londonderry. 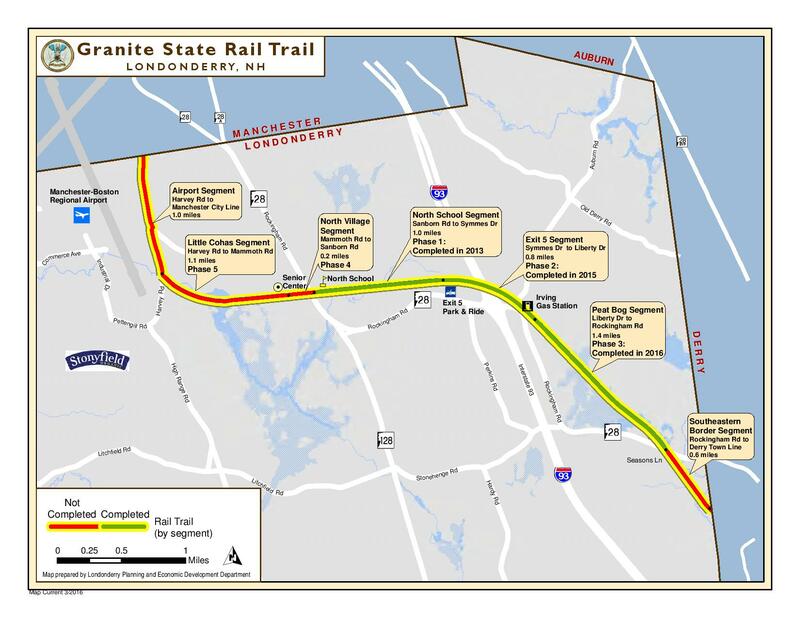 This trail will link directly to both the Derry & Manchester Rail Trails and be part of the 20 mile project known as the Granite State Rail Trail, that runs from Salem north to Windham, Derry, Londonderry & Manchester. Currently more the 11 of the 20 miles are completed. Where is it, and where can I park? There are 3 good places to park in Londonderry. The whole rail corridor in Londonderry is 6 miles long. The paved completed section is currently 3.2 miles long, (one way from North Elementary School to Route 28 at Season’s Lane, or 6.4 miles round trip). See the map above for detailed information on each section. This trail will eventually be part of a larger Granite State Rail Trail that runs through multiple towns in the state. Portions of the Granite State Rail Trail have been completed in Derry, Windham, Salem and Manchester. Click here to view a regional map. No, it follows the old railroad corridor, so it is straight stretch that you can go out then turn around to head back to where you started. Can I go beyond the paved section? No, travel beyond the paved competed sections is not recommended! It is rough terrain, over grown, uneven surfaces that are not maintained. Each section of the Rail Trail is funded through a combination of individual and corporate donations, federal and state grants, and funding from the Town of Londonderry following a Taxpayer vote. We appreciate every donation that helps make this project possible! What I can do to help? 2. If you have an employee matching gift program at your work, register Trailways (we can help) and utilize that to double your gift. 3. If you have a relationship with a business please reach out to us via the contacts page, so we can begin a conversation.